he lands on and mistakes the rustle of leaves for applause. Please sign my guestbook the link is on the right. Comments and suggestions are welcome on any poem or the site! Poetry is the art of imagination mixed with the language of choice, the creativity of the mind, and the effects of the senses. Poems do not necessarily reflect the personal thoughts or beliefs of the Poet. I think when you browse a Poet's page, you should take the poems for what they are and not what you may think they reflect. Like an Artist who paints a canvas and creates a scene of heavenly beauty, that painting does not mean he is religious. As you browse my poems, remember, they are just reflections of my desire to be poetic at that point in time and not necessarily an accurate nor descriptive reflection of my beliefs or thought processes. I do allow my daily life to influence my poems, but that does not mean it is an accurate reflection of my existence, thoughts, beliefs, or intentions. Nor does it mean I'm directing them towards anyone. Often I will send my poems out for some feedback. Sending them does NOT mean the poem is written about anyone. All artists desire feedback no matter the medium they are using. No matter what happens somebody will find a way to take it too seriously. Errors and misconceptions no doubt remain, and are my own. Now please enjoy yourself here. - every form of love, of suffering, of madness." 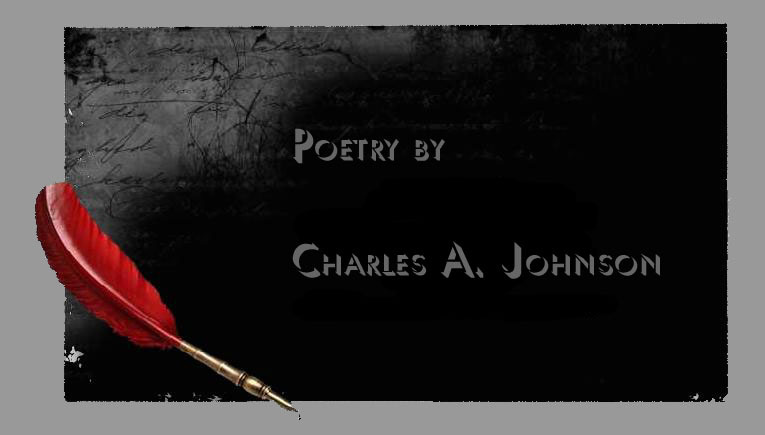 Click "Poetry By Chuck" for ALL my poetry. You've reached the website of Charles A. Johnson. This site is for the display of his works both past and present. Information & Pictures on this site are protected by U.S. Copyright and International Law. You may not copy nor hotlink to any part of this site.